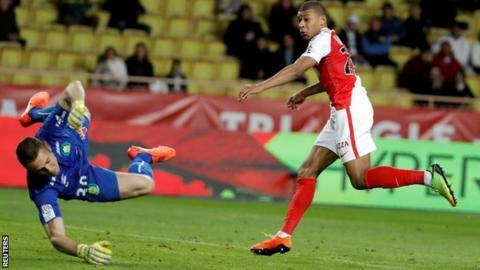 Teenager Kylian Mbappe scored twice as Monaco beat Nantes to move three points clear at the top of Ligue 1 again. The striker, who has been linked with most of Europe's top clubs, volleyed in a fourth-minute opener after Bernardo Silva's shot was deflected in the air. Valere Germain chested down the ball and fired home their second and Mbappe headed in a wonderful Silva cross. Fabinho scored a penalty to complete a comfortable win for Monaco, who are chasing a first title since 2000. France Under-19 international Mbappe, 18, looked disappointed to be substituted after 68 minutes, moments after going close to completing his hat-trick. He has now scored 15 goals this season. The principality side are three points above Paris St-Germain and Nice, who both won on Saturday. Match ends, Monaco 4, Nantes 0. Second Half ends, Monaco 4, Nantes 0. Attempt saved. Irvin Cardona (Monaco) left footed shot from the centre of the box is saved in the centre of the goal. Assisted by Thomas Lemar. Yacine Bammou (Nantes) is shown the yellow card for a bad foul. Foul by Yacine Bammou (Nantes). Substitution, Monaco. Irvin Cardona replaces Valère Germain. Hand ball by Nabil Dirar (Monaco). Substitution, Monaco. Nabil Dirar replaces Bernardo Silva. Offside, Monaco. Bernardo Silva tries a through ball, but Benjamin Mendy is caught offside. Hand ball by Amine Harit (Nantes). Attempt missed. Yacine Bammou (Nantes) left footed shot from outside the box misses to the right. Assisted by Léo Dubois. Attempt blocked. Prejuce Nakoulma (Nantes) right footed shot from the centre of the box is blocked. Assisted by Valentin Rongier. Substitution, Monaco. João Moutinho replaces Kylian Mbappe. Attempt missed. Valentin Rongier (Nantes) right footed shot from the centre of the box is high and wide to the right. Attempt saved. Kylian Mbappe (Monaco) right footed shot from the right side of the box is saved in the centre of the goal. Attempt saved. Jules Iloki (Nantes) left footed shot from the left side of the box is saved in the bottom left corner. Assisted by Yacine Bammou with a cross. Attempt blocked. Bernardo Silva (Monaco) left footed shot from outside the box is blocked. Assisted by Tiemoué Bakayoko. Substitution, Nantes. Jules Iloki replaces Emiliano Sala. Substitution, Nantes. Yacine Bammou replaces Felipe Pardo. Attempt missed. Léo Dubois (Nantes) right footed shot from outside the box is high and wide to the left from a direct free kick. Hand ball by Kamil Glik (Monaco). Goal! Monaco 4, Nantes 0. Fabinho (Monaco) converts the penalty with a right footed shot to the bottom right corner. Penalty conceded by Koffi Djidji (Nantes) after a foul in the penalty area. Attempt saved. Emiliano Sala (Nantes) right footed shot from the right side of the box is saved in the bottom left corner.